OshKosh B'gosh has an awesome online and in-store offer available now! OshKosh B'gosh online and in-store offer gives you an unique chance to save an extra up to 25% off your purchase. Spend $50 or more and take an extra 25% off your purchase. Or, receive 15% off your entire purchase (when you spend less then $50).To get this OshKosh B'gosh offer, enter the promo code SUNNY at checkout or print the coupon and present in at your nearest U.S. OshKosh B'gosh store location. 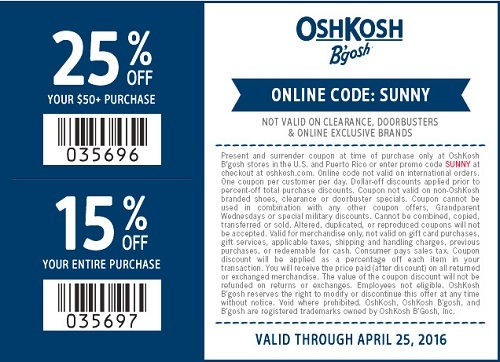 OshKosh B'gosh offer is valid until Sunday, April 24, 2016. Get a free shipping on orders of $50 or more. Source of the information is OshKosh B'gosh. For more details visit your nearest store location or official website.